The SPYDERCRANE Pick and Carry Crane (PC094) was manufactured and developed in the USA by Smiley Lifting Solutions. Filling the gap for a reliable compact crane capable of moving through a standard door and transporting materials weighing up to 1990 lbs, the SPYDERCRANE Pick and Carry Crane is being well received on tough jobsites. Offering a tip height of over 17 ft, a boom angle range of -17° to +50°, and 250 feet of wire rope on the drum, the SPYDERCRANE PC094 is one of the most versatile compact pick and carry cranes on the market. 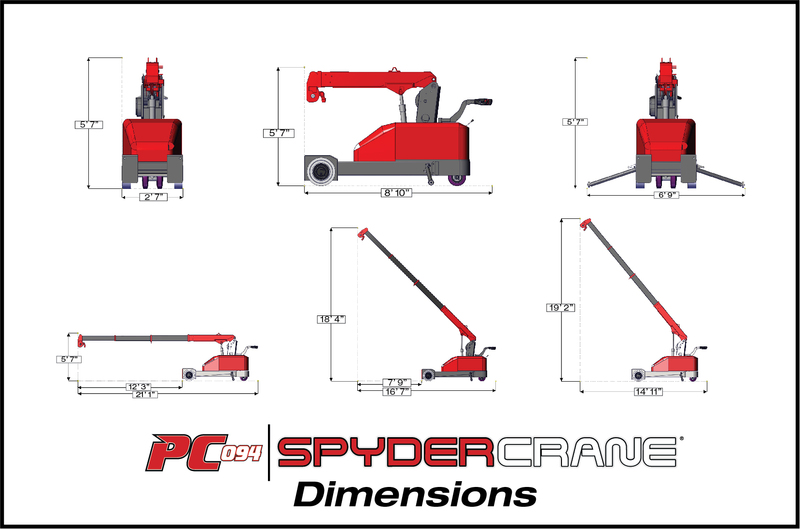 Designed with our customer’s needs in mind, the SPYDERCRANE PC094 is built with high quality materials and a robust design. Because of it’s versatility, the SPYDERCRANE PC094 can be found on glazing jobs, steel erection sites, and almost any general construction site.